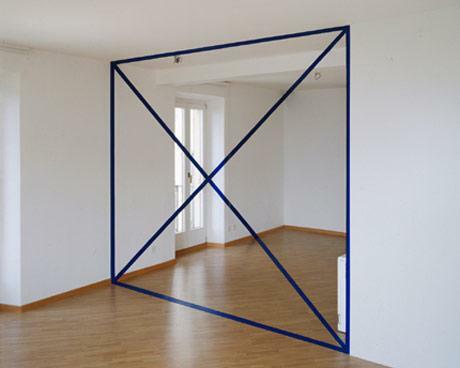 This remarkable perspective illusion was created by artist Felice Varini, the lines drawn on the wall produce the effect of a two-dimensional square and cross that appear to exist in three-dimensional space but only when viewed from one specific angle. how'd they get it so precise ? in a way it looks like someone drew it. in another way it looks like a drawing on glass. I do not get it what is ment to haeppen? I'm not sure is this a glass or just a puted metal square with two crossed lines. coool!! !that is very hard to do but worth it!! Take a projector and project the image that you want to see in 3d from that exact angle and location. then you paint or tape in the projected images in their actual location on the floor, walls, doors, and ceilings. Then when viewing from the exact location and height of the projector, then the image will appear to be a 3d image. Looks like a tape over a mirror but also could be dark blue ribbons across de walls to create that effect . There is a YouTube video of different angles of the tape being shown on the walls, but I forgot the source.